I was hoping for this newest version, but it still doesn't allow me to go from (for example) july to august without the game freezing... once I reach the end of the month, I have to shut down CT, go into the new month and then again open the CT to continue what I started... once would be nothing, but each month is frustrating... I know it's not game's fault, because without CT it goes from one month to another without any isues... am I the only one with this problem? Which scripts are activated when the crash occurs? The in-game hack script does not work in version 1.0.11. Just activated all of those and managed to simulate 3 months without crash. You need to find out which one is the problem by yourself and tell me, otherwise I'm not able to help you. All cheat table updates are for original game version (and newest patch ofc.). If you have cracked game version then you should stay with v.1.0.9 or buy the game and support developers. Do anyone know of a way to update in-game attributes automtically, based on a spreadsheet (or other format)? 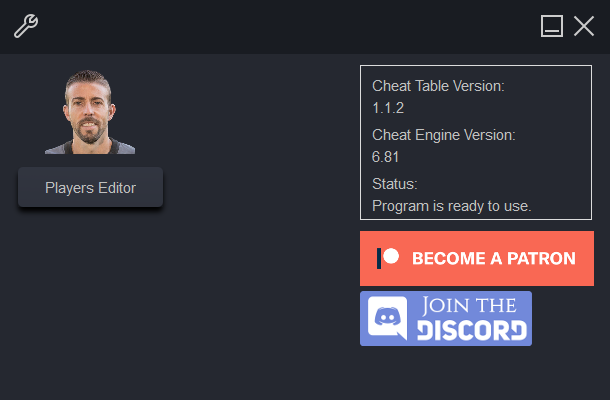 I just found out about the Cheat Table, and this has made updating attributes on an entire team a lot easier than the ingame editor, but it would be awesome if this could be done for instance with a script or something? I always create an in-game version of my real-life football team, and then we use that to play with ourselves (haha) in Fifa, whenever we meet for social gatherings. I have an Excel sheet that calculates all the ingame attributes, based on our real-life performance (matches played, goals scored, assists etc. and then a lot of randomizing of course). It is not at all accurate, but is based on selecting a few "defining" attributes that the randomizer then bases calculatuions on (for instance: one guy is very fast, so speed and acceleration is high. 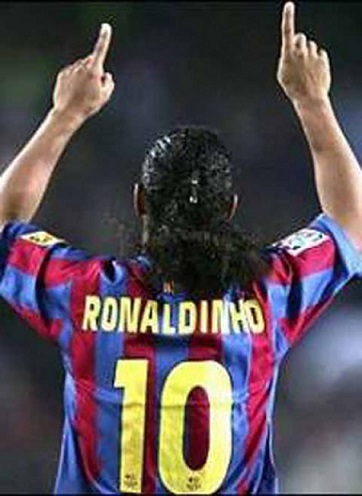 But he had a streak a few years back where he turned up a bit hungover to some games, so he could only play a few minuts at a time, before needed to lie on the sidelines - so based on this, his stamina is very low). This makes for a lot of fun, where the ingame players are sort-of based of what happens in the real-life matches. So I have all of the attributes listed in the Excel Sheet, and can format them any way needed, if there was a way to do this. It's possible. You can write lua script which will read your spreadsheet and then it will update player or players. With RDBM it will be probably easier, because you are not limited to lua and you can use your favorite programming language. DM me on discord (Aranaktu#2086) if you need more help. I probably won’t have time to look into it in the Bear future, but it is great to now that it should be a possibility. I am still hoping someone Else might have already done something like this, but if not, I Will probably get back to you at some point. First version with GUI is finally here! It took me a little bit longer than I expected, but I hope you will like it. May be unstable. Please, report all problems. With GUI editing players should be easier and faster than before. - Date fields are automatically converted to human readable form. You don't need online calculators to calculate player age. - Live preview on youth player headshot image while editing his headtype or haircolor. - Removed unnecessary 'More efficient training' scripts. When I click on some of the squares in order to activate them, i cannot make that x to show, to activate them. 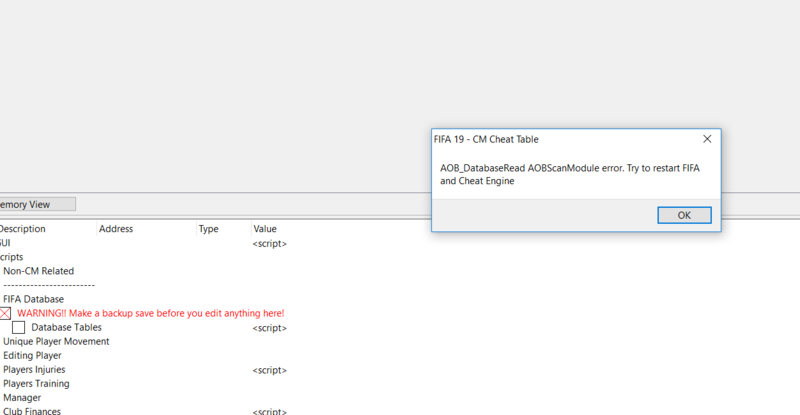 Second, in the last update, it keeps appears me an error ( AOB_DatabaseRead AOB scanmodule error) when i enter the cheat engine and when i try to activate some of the features. Bonus: since the first trainer, It's very hard for me to activate database tables. So atm we can't edit databases right? After last game update database tables script (and GUI) is not working on all CT versions below v1.1.7. MOD EDIT: Use the image link, the library/album link will not work with the image tag. Last edited by TheyCallMeTim13 on Wed Feb 27, 2019 1:12 pm, edited 1 time in total. When will you release version 1.1.7 for free? - Offsets with numbers only are now converted to string. - Added hotkey for 'Search player by ID'. It's 'Enter' be default, can be changed in settings. - Added 'Clear Cached Files' and 'Restore Default Settings' buttons to main settings. - You don't need to be in main menu to activate cheat table anymore. You can run cheat table even before you run FIFA. - Fixed "Database Tables" Script. and what is new in CT 118 my friend? 117 still seems not to be working with my fifa 19. EDIT: In fact it is EVEN WORSE! The CT crashes and i cannot use ANY of the scripts. With 116 it worked generally, but only some scripts did not. In 117 nothing is working at all! Just crash.